For the longest time I was a Gardein outsider. People raved about the companies products but since all the products I saw in stores contained quinoa and amaranth I could not eat them due to severe allergies to both ingredients. Matt has been eating the tenders for lunch and I asked him if he wanted to try the mandarin orange bits and started reading the ingredients and saw they did not contain the ancient grain blend! I was so happy! I tossed these with some steamed broccoli and served it over basmati rice. The dish was yummy but I wish the sauce packet was bigger. Next time I will serve it with a side sauce or something. Maybe add some Brags and chili sauce to the pan. I checked the ingredients of the Trader Joe's version and they contain quinoa and amaranth - to bad! 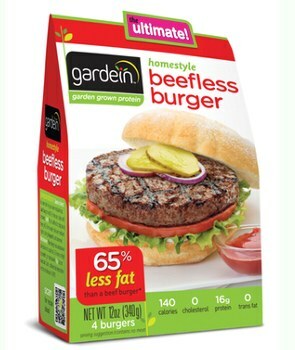 Another product I found to be OK for me to eat is the fresh beefless burgers Last night Matt grilled them for us. At first I thought they smelled like Boca burgers and I am not a huge fan of Boca burgers, not to mention one of my fave vegan burgers in a restaurant switched over to a Boca patty and I had it the previous night. However the texture of the Gardein patty remained moist with a touch of olive oil and smelled great. We served the burgers on a whole wheat bun, topped with melted cheddar Daiya, jalapenos and fresh organic avocado. To make the meal complete we ate them with crispy tots! Yummy! We plan on grilling the burgers again tonight and serving the patties with mac n cheeze - a fave childhood meal of mine! 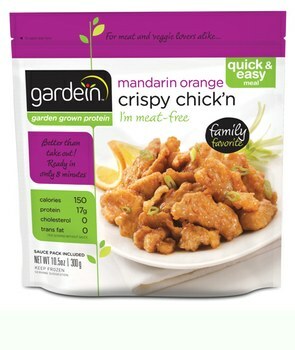 So yay I get to eat a few tasty Gardein products now! Mike loves their burgers. I've only had their stuff a few times and they were pretty good. Glad you could find some that you could eat! I am still a gardein outsider, and I'm with ya on the nay to Boca burgers. I like the idea of adding the sauce. Ditto to what Molly said about finding a gardein you can eat.